Oh how I wish I could carry off dark hair! Love the frayed hem on her shirt. Fab. Wow! This reminds me of the vest Axl Rose wore during a GNR performance. I like the biker look. Nice job mixing colors , patterns and seemingly disparate styles. The leather vest with a boho fringe jacket ? 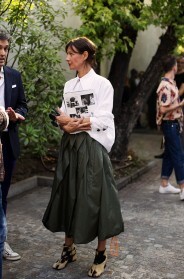 Very cool and love the ladylike strip clutch that tops off the whole look. I doubt I could pull off this ensemble as well as she does. I’m starting to see print on print here on the west coast. Another woman perfectly at ease with herself: she radiates great vibes, because you can see her look is not constructed at a sterile drawing table, but “lived in”. Her smile is the proof of the pudding: spontaneous and certainly contagious! This is great on so many levels. The fringe shirt under the biker vest with floral trousers and a striped bag. Layering! If it can be done with a room, why not an outfit. Now that there is what they call…………..pure style! Love her style, it’s tomboy and feminine. Moto-Mixture! Combined with b/w flowers! She make’s me smile! I don’t know if I should be terrifid or glad because of this post :) well, either way, thank you for recommending this primer! What an inspiring image of how to nonchalantly mix hard with soft elements- the moto leather vest with the silk floral pants – and to add one more layer by contrasting prints – floral with stripes with plaid. She has such a relaxed and confident personal style. She looks like Alexa Chung. I love how she mixed soft and edgy pieces together. The Moto jacket with the cool toned plaid shirt gives a rocker, easy going look but is balanced out by the bottom half of her outfit. The flowers on her skirt give the outfit a soft side. I love the mixture of colors, patterns, and materials. I believe the mix and match of this outfit and its accessories, such as the crisp handbag, allow this outfit to be feminine and lady like but still be casual and fun. I love how she combined a leather vest with a flannel top, it makes the outfit have more of an edge to it. The floral pants adds variety and uniqueness to the outfit, making it very original looking! Love the bohemian look! Thumbs up! I love the mixed patterns. Fabulous. I can never seem to pull off this look. She does it so well.